In April 2016, Ohio Wesleyan theatre professor Bonnie Milne Gardner (OWU Class of 1977), left, directed her final play, “Artifice,” before retiring. Ares Harper (Class of 2019), middle, was a member of the cast. The playwright, OWU alumna Anne Flanagan (Class of 1987), right, joined the two as part of a talkback event following a performance. Today, Gardner and Harper are the only two OWU students ever to have directed a main season production. For the first time in 42 years and only the second time in Ohio Wesleyan University history, a student is directing one of the Theatre Department’s main season productions. 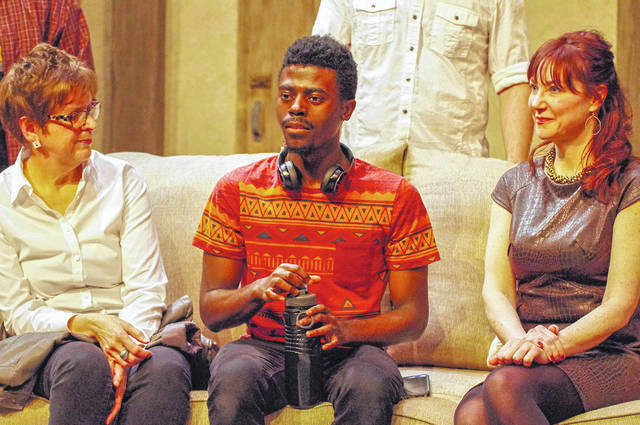 Ares Harper (OWU Class of 2019) of Columbus, Ohio, is directing “Cloud 9,” which runs Oct. 4-7. The first student to direct an OWU main season production was Bonnie Milne Gardner (Class of 1977). In fall 1976, Gardner directed Dale Wasserman’s “One Flew Over the Cuckoo’s Nest.” After earning her doctorate, she joined the Ohio Wesleyan faculty and taught for 31 years before retiring in 2016. “Cloud 9” will be performed on Oct. 4-6 at 8 p.m. and on Oct. 7 at 2 p.m. in Chappelear Drama Center, 45 Rowland Ave., Delaware, on OWU’s campus. General admission tickets are $10 and $5 for senior citizens, Ohio Wesleyan employees, and non-OWU students. OWU students are admitted free with a valid OWU ID. To reserve tickets, call the Theatre Box Office at 740-368-3855. Aleksei Pavloff is a current student at Ohio Wesleyan University who will graduate in December.